Connect –so that you can reach out to your colleagues no matter where you are. Create –where you can bring your project to life with all that you need. Access-where you can store all your files and find what you need instantly. Control-it helps in managing users, devices and data in a secured and easy manner. It’s a machine intelligence which makes the business less busy. This is because the everyday tasks are taken care of like automatically scheduling meetings and formatting slides. It’s due to this technology that helps in removing the business so that the teams can achieve more. It is the most advanced cloud infrastructure in the industry. The comprehensive security is built it at every layer from the reliable infrastructure to advanced detection of systems. The dedicated security professionals including the topic spurts stand behind everything we do to protect the information. This is one of the main reasons why some of the world’s most discriminating industries and customers have chosen G-Suite. G Suite makes working together easier. With the help of shared calendars you can see when others are available and schedule meetings with automatic email invites. With just a click turn your meetings into a video conference from any camera enabled computer, phone or tablet. It helps you to easily work on documents, spreadsheets and slides across your devices with or without internet. It makes working in a single document with team mates or people outside your company easy. One can see edits as others type, communicate through built-in chat and ask questions and comments. Multiple people can work at the same time and every change you make is saved automatically. It can keep all your work in one place with secure access from your computer, phone and tablet. It helps to quickly invite others to view, download and collaborate on any file without an email attachment. The file updates can be saved automatically stored and saved in the drive so that everyone can always have access to the latest version. It protects your company’s data and security options like a 2 step verification and single sign on, and use this mobile management your data safe in case of a lost device or employee turnover. You can archive email messages and on the record chats and control how they are retained. It also helps to easily configure security settings from a centralized administration control and call or email Google support which is available 24/7. 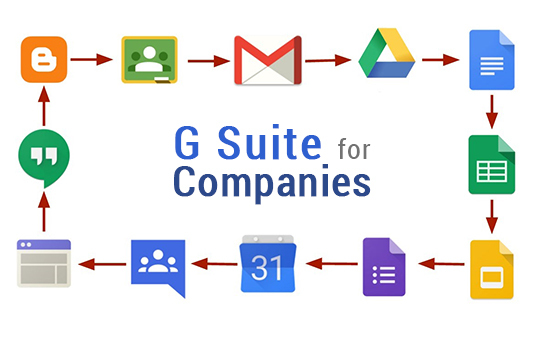 G-Suite is the future of your business and it would help to seek that business edge. Our association continues long after a sale is done. We are your Cloud partners for life. We are team of bright software professionals working to serve our clients with the finest services and solutions. Are you in search of an App which can connect your company as a whole? We at Inspirria Cloudtech, are here to help you. You can take us as your secured Google Partner in India with a decade plus of experience. We push productivity to its optimum level with some proven solutions that are used by best companies all over the world.